Okay, so the last Dreamweaver challenge of the year is to create a project with a New Year’s theme. Now I don’t officially start on the Design Team for another 4 days, but I thought I would take part, and show you guys how I made the Cherished Chum’s Christmas Card this year. Christmas! I thought you said this was a New Year’s Challenge?! I know, I know, but aren’t I always telling you that you don’t need to use Seasonal products for your projects? Well, now I’m proving it! We “Ring in the New Year” right? 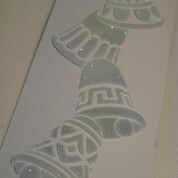 So I’m using the Dreamweaver Vertical Bells Stencil for this challenge. Step 1. Lay the stencil on a white piece of cardstock and using Removeable Tape, tape all the edges down (this will protect your edges from getting inked accidentally. Step 2. 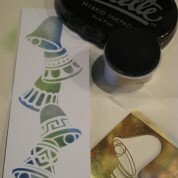 Using a dauber and your ink pad, dab colour where you would like it to be, through the stencil. Repeat for all colours. Step 3. 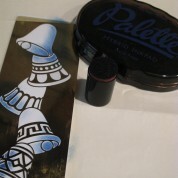 Clean your stencil thoroughly (Ink likes to attract the paste, and over time, your stencil will become gungy, so cleaning it between steps is very important) and re-tape it over your inked image. Step 4. 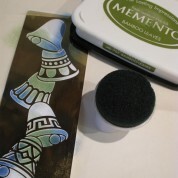 Apply the Translucent Embossing Paste liberally over the stencil with your offset spatula. 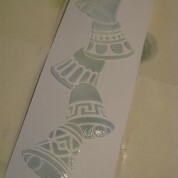 I like a fairly thick layer, so that it doesn’t seep under the stencil. Step 5. With your Offset Spatula at a 45 degree angle, scrap off the extra Embossing Paste from the stencil, leaving an even plane. Try not to go over the image more than once as the paste will start to seep under the stencil, but if you must go over it again, I like to start back at the top to prevent “lines” in my paste should I start in the middle. This step takes some practice, but remember, you are only trying to get the top layer off, you don’t need to press hard with your spatula. In class, I make my students take their elbows off the table to prevent too much pressure. Trust me, it’s easy. Step 6. 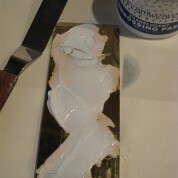 Remove the Stencil and wash it, and your Palette knife immediately. Once that paste dries, it’s tough to get off, but a Mr Clean Magic Eraser will work, just be gentle so you don’t bend your stencil. Step 7. Pour a Clear Glitter over top of the wet paste, tap off the excess and wait for it to dry. Step 8. 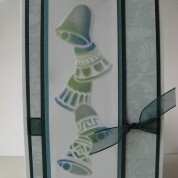 Attach it to the front of your card! From start to finish, this project only takes about 5 minutes (plus an hour for drying time) so it actually took me longer to write this tutorial than it did to create the image! This entry was posted in Featured Scrapbooking Products, Tutorials and tagged Dreamweaver, Embossing, Glitter, Paste, Stencil, Tutorial. Bookmark the permalink. Great tutorial Jessie – Can’t wait for the next one. Congrats on the design team. This is beautiful. I love the technique you used, and the colors are so soft and lovely.